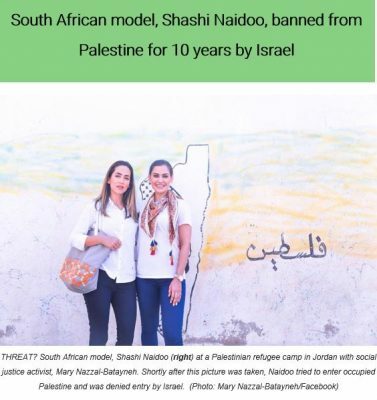 By Afro-Palestine Newswire Service: On Wednesday, South African model and actress, Shashi Naidoo, received a 10-year ban from Israel after she tried to enter the West Bank to educate herself about Israel’s occupation of Palestine. After visiting Palestinian refugee camps in Jordan, Naidoo was to enter the Occupied Palestinian Territories (OPT) through the Allenby Border Crossing in Jordan. Israel’s Deputy Ambassador to South Africa, Ayellet Black, told South African media that Naidoo was denied entry at the Israeli checkpoint because her trip was planned by the South African branch of the Boycott, Divestment and Sanctions Movement (BDS), and that it would “harm” Israel. Naidoo, however, is travelling at her own expense, and the itinerary of her trip was planned by the South African Council of Churches and South African Jews for a Free Palestine. The trip materialised after Naidoo used text – prepared and supplied by a friend – to defend Israel’s violent response to peaceful protests in the Gaza Strip that resulted in the death of over 100 Palestinians. Following a backlash for her use of pro-Israel propaganda, Naidoo deleted the posts and issued an apology. She then announced her intention to educate herself about the reality of the Israeli occupation by going to “see for herself”. Although Naidoo appeared at a press conference hosted by BDS South Africa, she has never advocated or endorsed a boycott of Israel. Other notable Africans that have been denied entry include Archbishop Desmond Tutu and Justice Richard Goldstone. 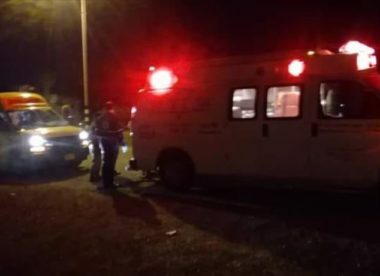 Israel has also detained, interrogated and deported an increasing number of Christian volunteers with the World Council of Church’s’s Ecumenical Accompaniment Programme in Israel/Palestine (EAPPI). The Afro-Palestine Newswire Service provides reliable information and breaking news relating to Palestine-Israel and Africa. Our network of agencies uses correspondents on the ground in the occupied West Bank, Gaza Strip, Jerusalem, within Israel and throughout the Middle East and Africa to produce high-quality English news reports to African journalists and editors.